The Sweet 16 has been elusive for the ASU women's team. Not this time. CORAL GABLES, Fla. – Arizona State was in a familiar spot entering the fourth quarter Sunday night. The Sun Devils have played eight games against Top 10 teams this season going 2-6 with the only pair of victories coming against Oregon State. Five of those six defeats were decided by single digits for a combined 28 points. 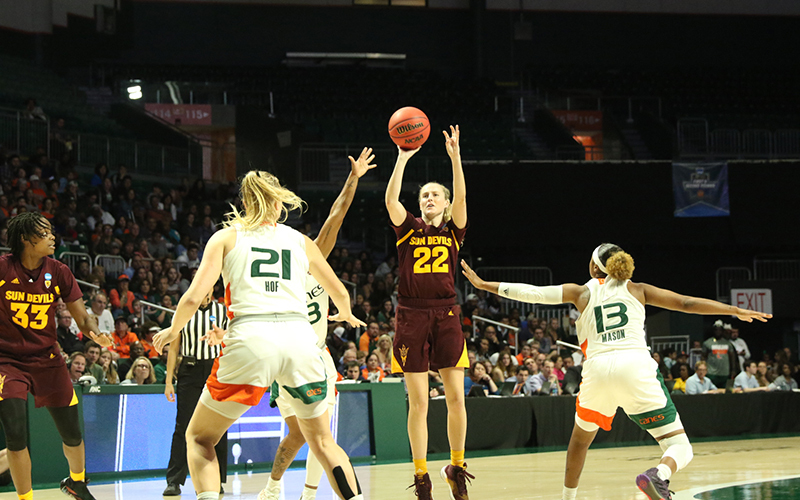 All those disappointments set the stage for Sunday’s NCAA Women’s Basketball Tournament second round game between the fifth-seeded Sun Devils and the fourth-seeded Miami Hurricanes. This one ended differently. The Sun Devils are headed to the Sweet 16. After erasing an eight-point second half deficit, the game entered the final minute of regulation tied. Arizona State’s tenacious defense forced a steal with 10.2 seconds remaining leading to Robbi Ryan getting fouled on a transition layup. Ryan made both free throws to give ASU a two-point lead. After a Miami timeout, the Hurricanes fed one of their productive post players, Emese Hof, for a layup, but the shot rolled off the rim and the Sun Devils prevailed, 57-55, for their first Sweet 16 appearance since 2015. Senior Kianna Ibis said they learned from every close defeat they’ve had this season, helping them persevere Sunday night. For the senior group of Ibis, forwards Courtney Ekmark and Sophia Elenga and center Charnea Johnson-Chapman, this is the culmination of four years of hard work. ASU’s toughness was praised by Miami Hurricanes coach Katie Meier after the game. It was a collective effort for the Sun Devils as they had eight players score with forward Jamie Ruden leading the team with 10 points off the bench. ASU dealt with Miami’s Twin Towers of Hof and forward Beatrice Mompremier. Despite grabbing 22 rebounds, Mompremier was held to just six points on 3-for-12 shooting. Hof struggled all night finishing with six points on 2-for-5 shooting. Turner Thorne said she would have hesitated if someone told her they would win this game while being outrebounded by 11, but she said it goes back to the toughness her team has shown all season. 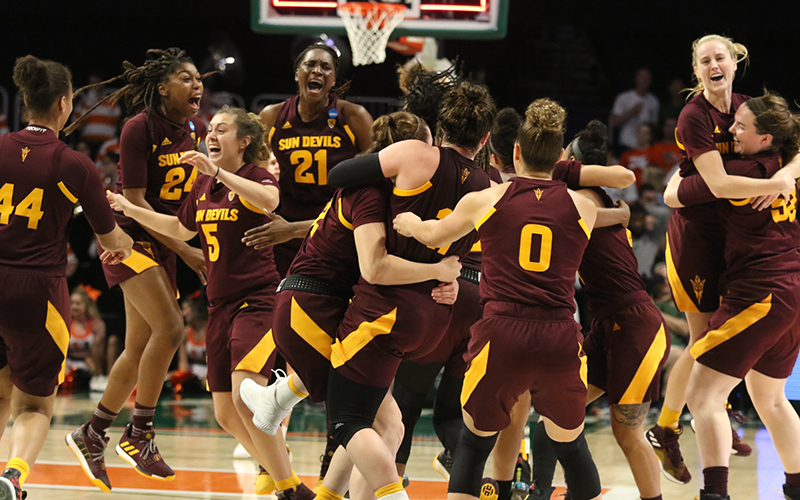 Before the start of the NCAA Women’s Basketball Tournament, an ESPN article cited Arizona State as a loser for their draw as the only out-of-state team to play in Coral Gables, Florida, joining the hosts Miami, Central Florida and Florida Gulf Coast. They leave the Sunshine State as the only team standing and will head to West Coast-friendly Portland to face the top-seeded Mississippi State Bulldogs. Turner Thorne’s one word to describe this team is selflessness and that’s what makes this moment so special for her and the team.